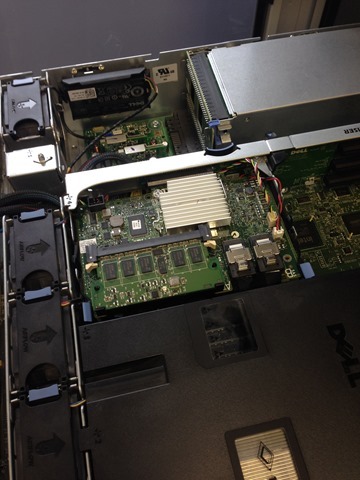 Replacing a Dell PERC H200 to a Dell PERC H700 RAID card is surprisingly easy. These are the steps I followed when upgrading my Dell PowerEdge R510 Server. The H700 Card is much faster than the entry level H200 and it additionally supports RAID 5. So, it is a worthwhile upgrade if you intend to add more storage to your system . IMPORTANT! Make sure you have a FULL backup of the server, just in case anything goes wrong. I really can’t stress this enough. Please be aware that the information within this article is provided “as is” without warranty of any kind. Configuring RAID is not difficult, but it is essential to be careful. One false move and you will obliterate the contents of your hard drive(s). You may wish to practice using some spare hard drives first. Ensure that you read and fully understand these instructions (plus the supporting articles) before attempting the upgrade yourself. 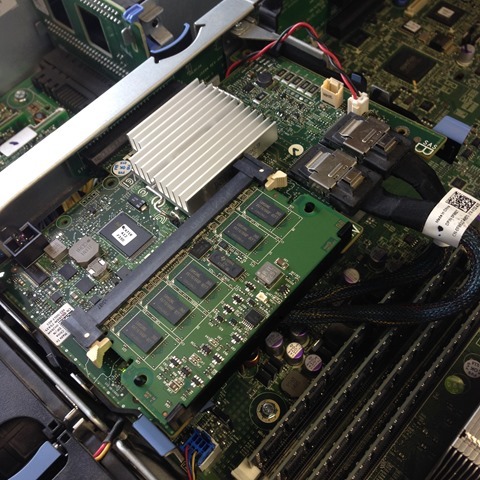 If you have a spare PCIe slot within the server, shut the system down and install the H700 card alongside the existing H200 card. 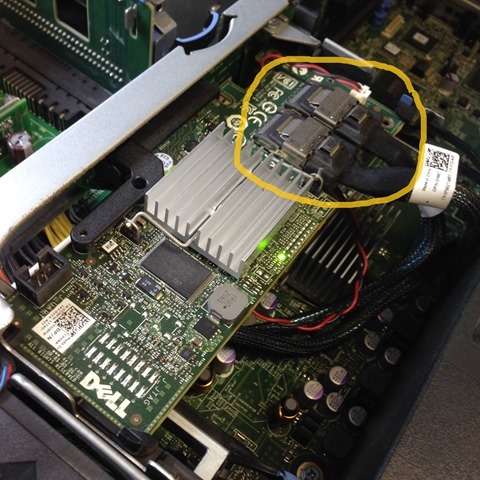 Do not disconnect anything from the H200 card at this stage, just clip the new card into the riser and start up the server. The image above shows the H200 and H700 alongside each other inside the server. Windows Server 2008 R2 should find and install the H700 device driver automatically. It is still worth visiting Dell Support Site and installing the latest version, just to be on the safe side. Check ”Device Manager” and ensure both cards are listed. This step will ensure that we don’t have any driver issues when the H200 Card is removed in the next step. Optionally, you may also wish to review / update the firmware on the new card. Update (May 2016): I have received a couple of reports (below) of the import failing. My thoughts are this could relate to the firmware version. There is a newer Firmware Version Available (12.10.7-0001, 24 Mar 2016) and you may wish to consider this. Shut the server down again and carefully remove the H200 card. You will need to disconnect the small LED indicator lead and the hard disk cables (shown above). Install the H700 in place of the H200. It is a larger card, but it will fit into the same riser. Finally, connect the Drive Cables and the LED indicator lead (see above). Install the backup battery (your H700 should have come with one). Now it is time to start up the server and configure new the RAID Card. 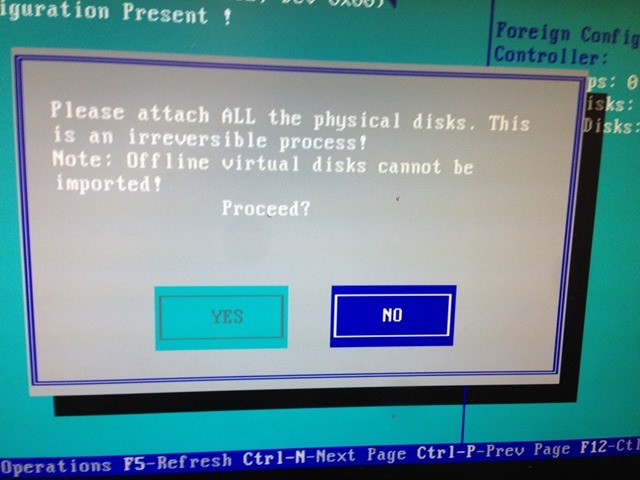 When prompted, press CTRL-R during system start-up to load the PERC “Virtual disk Manager”. Since this is a new card, there should be “No Configuration Present!” Do not continue if this is not the case. 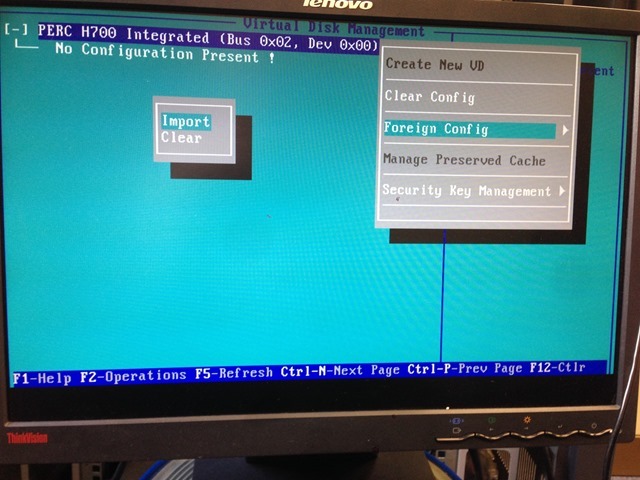 Press “F2” (Operations) and select “Foreign Config” from the menu. Then, select “Import”. Confirm that you wish to continue. Within a couple of seconds, your existing RAID configuration will be displayed on the screen. 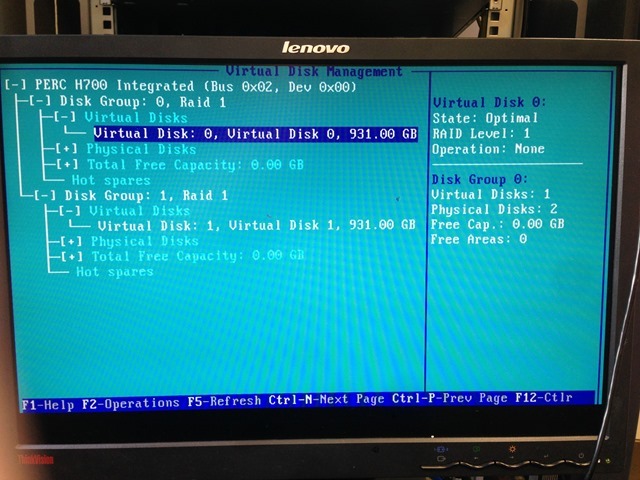 In my case, I have four physical disks configured into two RAID 1 Virtual Disks. Press “ESC” on the keyboard and reboot your system. That completes the upgrade. If everything is working without issues, go back and fit the RAID backup battery and plastic cowl. The image above shows the finished job inside the server chassis. How about if I fail to import from foreign configuration ? How can I manually re-configure ? I use 4 HD for RAID5. Are the disks not showing up as “Foreign”, or did you get an Error during the Import? I tried that and everything went fine up to the point where it was importing. It finished with error saying that is not possible to import offline disks. all are online. but returns error. when reverted to H200 shows no OS detected. How many Drives are in your Array? Are they all listed within “Physical Disks”? I got a spare like for like server and after creating new RAID array 1 0 on h200 I was able to restore the system from MS backup. on both machines. After that on the main one I managed to “successfully” import foreign array from h200. And it is visible on the controller as one virtual drive. However, it is unable to boot SBS. Returns BSO 0x0000007b. When using live CD I can see the data on the drives. I am stuck a big time. Now I am trying to restore the server on the h200, than to create a image of the drive on the HDD connected to the SATA port. Plan is to, swap to h700 create a new RAID 1 0, and to restore the drive image on to the newly created array. Ghost says that it will take 2.5days to clone the drive! With only 260GB. Hopefully, image creation will be faster. If that doesn’t work I don’t know what to do other than reinstall. If anybody tries to restore system from MS backup in to the new RAID 1 0 on h700, it doesn’t work. I managed to restore the backup on to the borrowed like for like server at 3am in the second attempt. And after recreating the array (RAID 1 0) under h200 on to the master server too. All 4 HDDs are visible as one virtual drive. Which I managed to import via h700 without problem at that stage. However, this time was with out the error upon the import. But SBS is not booting up at all. it crashes on BOD 0x0000007b relating to the storage. When I use the Live CD I can see that all the files are on the HDDs as they should. But I am unable to start OS or to use recovery options from SBS disk. And I am stuck. Now I am in to process of restoring MS backup on to the h200 array, I will create a image of it and will try to restore it on to new array on h700. – Restoring system from MS backup done under h200 on to the new array with the same raid 1 0 but on h700 will not work. – Installing SBS 2008 on to the system and than restoring, will fail too. – do it in 11h over the night. Thank you for the updates. I really hope you got this sorted. I can’t help feeling this must be some sort of firmware issue. I will check the versions on the H200 and H700 and add them to the article. upgrade to h700 failed. When reverting back to h200, same error as Piotr, Missing Operating System. Verified correct virtual in raid config is setup for boot. Any ideas? Oh, no! My understanding has always been that importing a foreign array is a benign process, and the H700 doesn’t actually write anything to the disks themselves. It either fails or succeeds, but it should always “fail safe”, allowing you to move back to the H200 if needs be. I haven’t has any difficulties moving disks between PERC array in the past, and have always found them reliable in this respect. Even if you array is “degraded” (and one disk is out of action), it should still be possible to move it across. Did you have any errors or warnings in the console before you began?